OurTime has been around for decades, and it’s constantly evolving to better meet the needs of single seniors. While this is one of the best aspects of the site, sometimes it can be hard to keep up with its changes, including the pricing. That’s what we’re here for, though. We’ve got the most up-to-date information about what an OurTime membership may cost you. When you join OurTime, you’re automatically given a basic membership that never expires. Just provide your gender and the gender you’re looking for, location, date of birth, username, email, and password. Then you can fill out the rest of your profile with information about yourself and your ideal date. You can also upload several photos, browse for matches, receive matches, send flirts, like photos, save your favorite members, receive messages, and find out about live OurTime events in your area. 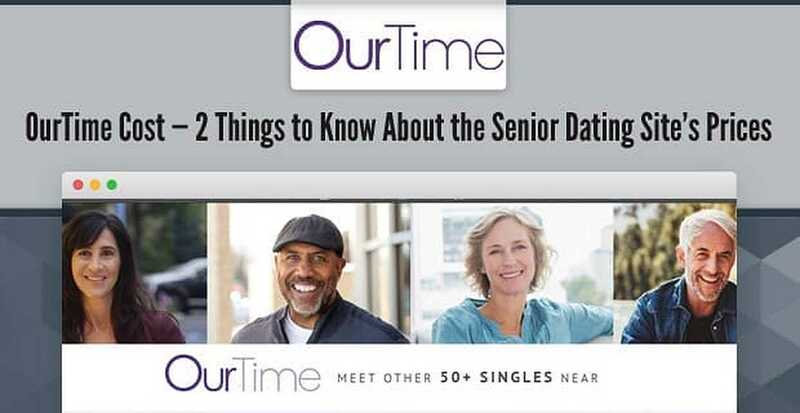 OurTime is one of the most popular senior dating sites, but it’s still good to test it out for yourself to see if it can meet your needs. We will say, though, that you’ll probably like it. OurTime has millions of users and monthly visitors. It’s easy to use, completely safe, and a sister site of Match — which means it’s trustworthy and it works. If you want full access to OurTime via your desktop, iTunes, or Google Play, you’ll need to upgrade to a premium membership. As a premium member, you’ll be able to read and reply to messages, have your profile and messages highlighted, know when someone’s read your messages, see who’s flirted with or favorited you, and send virtual gifts. You’ve got a few options: The Best Value Plan is the membership we’d recommend. You have to sign up for at least six months, and you’ll make a one-time payment of $107.76 plus tax. This comes out to $4.49 a week, and you’ll save 56% compared to what you’d spend on the Full Price Plan ($29.96 plus tax upfront, or $7.49 a week). There’s also the Standard Plan, which requires a minimum commitment of six months and costs $90 plus tax ($3.75 a week). Whether You End Up Spending $0 or $8, OurTime is a Smart Choice! OurTime is a high-quality dating site, but that doesn’t mean you have to spend all your life savings on it. Obviously, you’ll get the most out of the site if you commit to a paid membership, but a free standard membership offers numerous helpful features too. And, remember, you can always check DatingAdvice.com for the latest on OurTime’s pricing as well as other dating industry news!